Homemade Mama – Welcome to my homemade life! Coming from England, I’ve never really had to deal with a severe weather emergency. We don’t get hurricanes, tornadoes or much like that, although flooding has been more of an issue in recent years. But here in Houston, it’s a different story. The roads seem to flood every time it rains, and there have been several tornadoes this year. Now, we’re facing a potential tropical storm, which might turn into a hurricane. So, in an effort to be prepared and organized, off to target the little man and I went in search of supplies in case of a few days without water or power. Thankfully, we currently live on the 3rd floor, so it’s unlikely that we’ll have to evacuate because of flooding, but we’ll be packing a bag of clothes and filling up gas tanks just in case! More likely is that we’ll be stuck at home with no means of cooking and having to throw out all of the food from our fridge, and have no water. With that in mind, I figured that cartons of soup would be a good place to start, since they don’t need anything to open them and they can be eaten cold. They might not be that appetizing, but they’ll provide nutrients and liquid. I also stocked up on protein bars and protein-rich snacks, since they provide easy calories. While I don’t normally buy sweet snacks to keep at home, as a scientist I know that hormone shifts during the body’s stress response can limit the availability of glucose, which is essential to keep your brain working properly, so we opted for fruit snacks to provide some sugar when needed. Normally I make all of the little man’s baby food, but I didn’t want to count on our stocks surviving a power outage, so in to the cart went a few days worth of pre-made containers in varying flavors. When you pack these into the box, I recommend taking them all out of their boxes if they’re individually wrapped, since they take up less space this way. So that plus a couple of cases of water should have us nutritionally taken care of for a few days. Then it came to the rest of the kit. Trash bags, not just to get rid of trash and keep the bugs out, but also in case a window gets broken. Flashlights, batteries, baby wipes to keep all of us clean (ish at least! ), and of course duct tape, because what can’t be fixed with duct tape?! We have always kept a fully stocked first aid kit in the nursery along with plenty of hand sanitizer, but if we hadn’t I would have been stocking up on those too. Last but not least, a sturdy box with a water resistant seal to pack it all in, and we’re ready to go! Ok, not quite, but we definitely will be by the time the storm gets here on Friday. Wish us luck! Now that my little man is 8 months old, we’re venturing into the world of finger food. More accurately, he is dragging us into it by insisting that the only way he’ll eat is if he can do it himself. Sadly, he’s not actually able to do it himself yet, so we’ve had to find some middle ground. 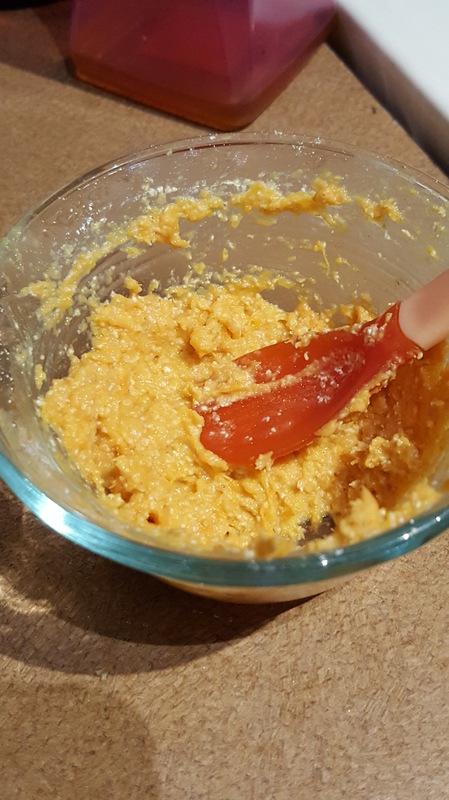 This might be a few pieces of shredded cheese or some homemade baby puffs, or it might be pieces of anything else that’s soft enough for him to mash up but big enough to keep his hands busy. My son is a very food motivated child, to the point where no-one else can eat in front of him without him screaming because he wants to eat too. In fact, I don’t think I’ve ever seen him do such a sad face as the day we went out to eat at a local diner and he saw a little boy running around with a pancake in each hand. Cue my quest to make baby safe pancakes! When I first tried this recipe, he wasn’t able to eat wheat yet, and he still can’t have whole eggs. 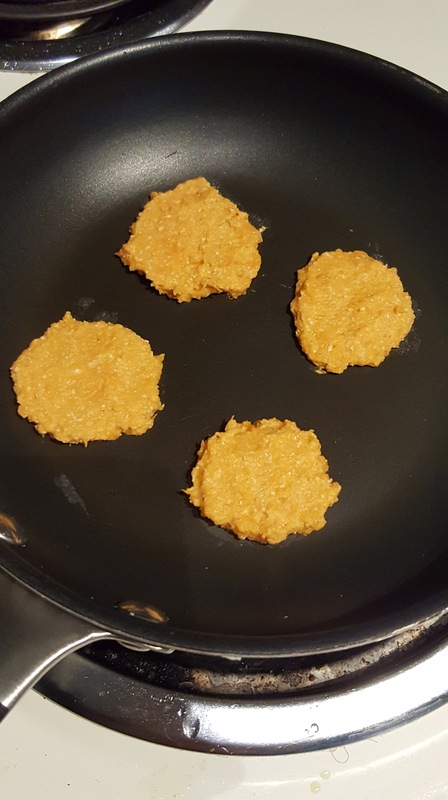 I have an oat pancake recipe that I love, so I started with that and tried to work out how to make it baby friendly. It turns out, baby pancakes really don’t need much at all. 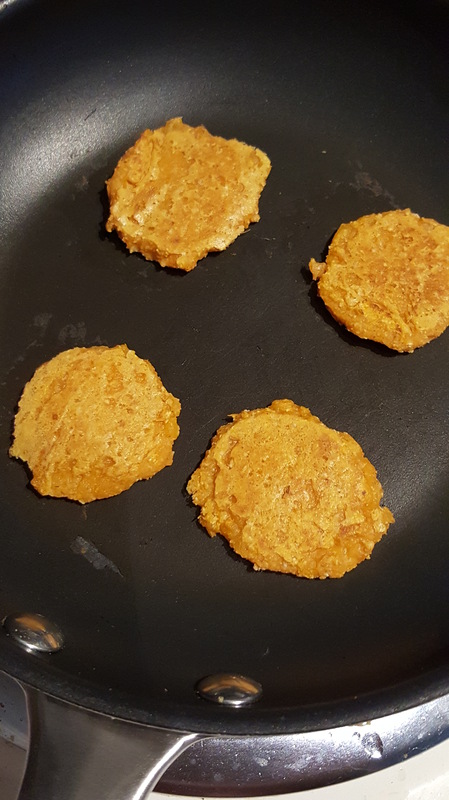 In fact, I make them with just 2 ingredients – ground oats and sweet potato! You could probably do this with any fruit or veggie puree you wanted, you just might need to adjust the quantity of oats depending on the water content. For each ounce of sweet potato, I mix in 1 tbsp of ground oats. If you cook it in a non stick pan, you also don’t need any oil. Just spread the mixture in small rounds, about the thickness of a quarter. Cook over a low – medium heat for a few minutes. Once they start to look like they’ve dried out on the top, they’re ready to flip. Cook for another couple of minutes and there you have it – nutritious, baby-safe pancakes! If you keep these in the fridge they’ll be fine for over a week, I just warm them for a few seconds in the microwave when it’s pancake time. 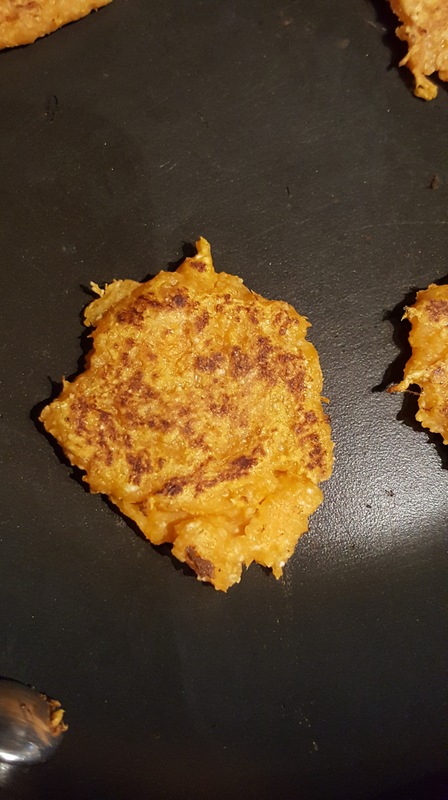 I hope you and your little one enjoy these, and if you make them with something other than sweet potato, I’d love to hear how they come out! This is my first ever attempt at making my own barbecue sauce, and I also wish to point out that I am originally from England where we barbecue once a year if we’re lucky, so please forgive me if you look at the recipe and think “that’s not real barbecue sauce”. Feel free to call it whatever else you want if that name bothers you. This was made with a minimal number of ingredients, all of which could potentially be left out or substituted if you have something else that you want to use. First of all, sweat a small, finely chopped onion down in a small amount of olive oil. Add a peeled and finely sliced 1 inch piece of ginger and 3-4 cloves of garlic, and cook for another 2-3 minutes until fragrant. Add the diced peach and mango and cook for around 15 minutes on a low heat until the fruit breaks down. This may be a shorter or longer time frame for you, depending on how ripe the fruit is. Add around 1/4 cup of apple cider vinegar, 1 tsp each of ground coriander, cumin and salt, and 1/2 tsp each of all spice and black pepper. Add 1/2 – 1 tsp chili paste (or don’t, if you don’t like it) and cook for a few more minutes to incorporate all the flavors. Blend until smooth, and return to the pan. Simmer for around 30 minutes, adjusting the acid and sweetness level with more vinegar and either agave, maple syrup or brown sugar according to your personal taste. Add around 1 tsp of lime juice. Let it cool and it’s ready to go! I hope you enjoy this. If you try this, especially if you try it with other ingredients, please let me know how it turns out! Coffee has been something of a necessity for me for many many years now. It’s truly a miracle that I manage to get anything done without it. I tried to go completely decaf during pregnancy, and in all fairness I made it to about 3 pm. Admittedly, that was actually “scraping through to 3 pm wondering why I’ve been completely useless all day” making it. So not really… However, despite my absolute requirement for coffee, I couldn’t stomach iced coffee at all until a couple of years ago when I discovered a far too unhealthy caramel, chocolate and cream laden concoction at a local cafe. Since then, I have discovered the wonder of all manner of frappucinos and cold brews. I will say that I need extra flavor in my cold coffee, especially if it comes with ice cubes. However strong the coffee is, you lose so much flavor by having it cold. So, I was far too excited when I found out about the coconut cold brew at starbucks. Toasted coconut syrup and coconut milk in a cold brew? Yes please! I don’t often go out for coffee these days. It’s typically only after my Saturday morning yoga class. A couple of weeks ago I left class all excited about my coconut cold brew, and was even feeling nice enough to pick one up for my husband too. I got them home along with a couple of breakfast sandwiches, and was so excited to dive in. It was unbelievable… But sadly, not in a good way. It tasted of absolutely nothing. No coconut flavor. No coffee flavor. Just watery, but still headache-inducing, brown stuff. Total waste of money. However, the excitement of what that coffee could (and should) have been, wouldn’t go away. So, I decided to have a go at making it myself. Since it’s a cold brew, it does take time. But it’s totally worth it. And an extra tip – instead of putting ice cubes into your coffee, freeze undrunk coffee in ice cube trays and put those in your coffee instead. That way, you won’t water it down, and the flavor will stay nice and strong. I like to make the coffee the night before. Use your regular amount of coffee, put it in a french press with water and put it in the fridge overnight until you’re ready to drink it. Next comes the syrup. Dissolve half a cup of sugar in half a cup of water over a low heat. At the same time, toast half a cup of unsweetened coconut until golden. Add the coconut and 1/2 teaspoon coconut extract or essence (if using) to the syrup, remove from the heat and leave for 3-4 hours to infuse the syrup with the coconut flavor. Strain and reserve the coconut. Normally we have coconut milk in the pantry, but I guess I used it all when I was cooking, so I decided to make toasted coconut milk! Rinse the coconut to remove any remaining syrup (otherwise your coconut milk will be very sweet) and add to a blender with 1 cup water. Blend until smooth and strain to remove the coconut pulp, squeezing to make sure you get all of the milk out. And you’re ready to go! I don’t sweeten my hot coffee (with the exception of my December peppermint mocha obsession), but I find I need around 3 teaspoons of syrup in a large cold brew to get the flavor, and this syrup is no exception. Next I plan to try out some other flavors of syrup, so I’ll post the recipes when I have them figured out. Enjoy! To make the coffee: Put your usual amount of coffee in the french press and fill with water. Leave to brew in the fridge overnight. Strain to remove the pulp. Store in the fridge.